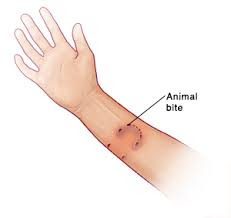 An animal bite can result in a break or tear in the skin, a bruise, or a puncture wound. Bites that result in puncture wounds are more likely to become infected. You might have a puncture wound if an animal's tooth went through your skin during the bite. Some animals are infected with a virus that can cause rabies. Bats may spread this disease. Rabies is rare but can be deadly. If you get a rabies shot very soon after you are bitten, you can develop immunity to the disease and not get sick. For more information on this disease, see: Rabies. You may need antibiotics even if you did not need stitches or a rabies shot. · Cat bites are less common (பூனை கடித்தல் என்பது குறைவு), but have a higher risk of infection. Cat teeth are longer and sharper, which can cause deeper puncture wounds. · Stray animals and wild animals, such as skunks, raccoons, and bats, also bite thousands of people each year. 1. Calm and reassure the person. Wear latex gloves or wash your hands thoroughly before attending to the wound. Wash hands afterwards, too. 2. If the bite is not bleeding severely, wash the wound thoroughly with mild soap and running water for 3 to 5 minutes. Then, cover the bite with antibiotic ointment and a clean dressing. 3. If the bite is actively bleeding, apply direct pressure with a clean, dry cloth until the bleeding stops. Raise the area of the bite. 4. If the bite is on the hand or fingers, call the doctor right away. 5. Over the next 24 to 48 hours, watch the area of the bite for signs of infection (increasing skin redness, swelling, and pain). 6. If the bite becomes infected, call the doctor or take the person to an emergency medical center. Do NOT go near an animal that may have rabies or is acting strangely or aggressively. Do NOT try to catch it yourself.